Daily Illuminator: Dewbacks Are Awesome! 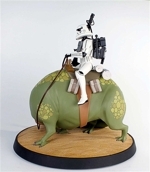 December 6, 2012: Dewbacks Are Awesome! My office already has one Dewback statue and now I've pre-ordered a second, this time an animated-style Dewback statue that's up for pre-order at Gentle Giant. Ever since I was very young and owned the old Kenner Dewback toy (this old commercial brings back memories) I've loved these guys, and even after the physical changes to the creature design made in 1997, it is still one of my favorite Star Wars monsters. And I'm betting that there are others out there who will find the new animated Dewback statue as adorable as I do. Yes, I'm a geek. But I can admit it and embrace my geekdom if it means getting another Dewback statue for my office.